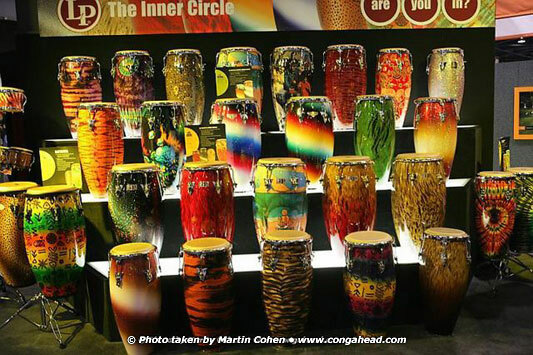 The widest selection of finishes ever offered in congas and bongos. Winter NAMM 2006 was especially exciting because LP® presented the widest array of drum finishes ever offered by any manufacturer, ever. All were produced using proprietary techniques developed especially for this year's NAMM show. There also was the addition of the Giovanni Compact Bongo to the highly successful Compact Congas. As usual, the LP exhibit was the most exciting, with world-class LP artists jamming on all the new drums. The "Great To Be An LP Endorser" feeling was very apparent by the huge turnout of percussion lovers from all over the world.